These Olivia B black onyx hexagon earrings that dangle make a beautiful contemporary statement. Specially designed in the U.S. and crafted in 14K yellow gold. We are very excited to carry this excellent jewelry from an American female designer because of it’s contemporary style and it’s affordability. You’ll want to wear these earrings all the time since they go with everything. They feature plenty of style without overpowering your other jewelry or your outfit. Pairs equally well with business attire or a night on the town. Her jewelry is also very comfortable to wear, notice the tapered lever-back ear wires. And, they’re also a nice easy weight to dangle from your ears. Shari Cuartero is an award-winning designer who began in New York City. After graduating in Jewelry Design Shari went on to work for a few fine jewelry manufacturers until founding her own line inspired by her daughter, the namesake of the company. 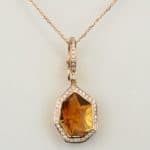 Olivia B was launched in 2016 and is becoming popular for her use of richly colored gemstones. Many of her designs use dangling briolette shapes or smooth cabochon stones instead of the usual faceted stones. She then uses thin gold settings that give this line a light contemporary look with a slightly bohemian feel.